People are making decisions about you and your business based on what they see online. If you want to generate leads from the internet, it is vital that you have an appealing online presence. That means that your online presence needs to be attractive and professional looking and establish credibility and trust. The key to getting your message heard is appealing to the right audience. No matter what you sell, not everyone is your ideal customer. By targeting the right people you can focus your efforts and increase your conversions. Read below for specific strategies you can use to be appealing. Online directory listings listings can be a great source of new leads for your business. Your listings can often be the first engagement that people have of your business and can make a powerful first impression. That’s why it’s so important to have optimized directory listings. Social media can be a great source of new customers for your business because people can discover your through search and through sharing which has an element of social proof. Learn what to do here. 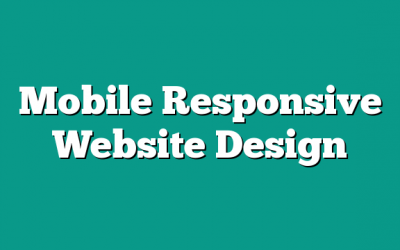 Mobile responsive website design has become the standard for website development because the internet has gone mobile. Learn how to go mobile here.